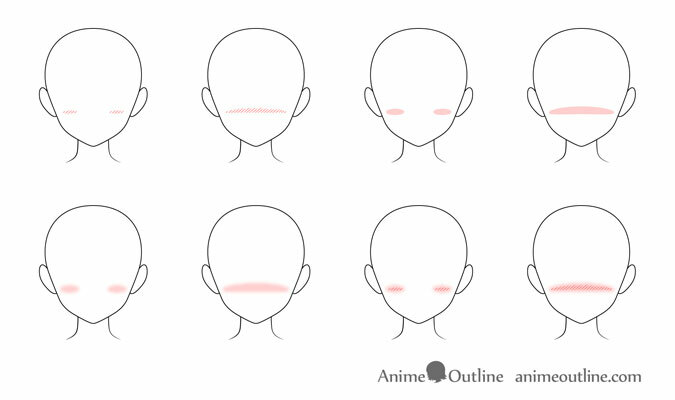 This simple tutorial explains how to draw anime and manga style blush and shows several different examples of it’s most common types. In anime and manga a blush can indicate emotion like love or embarrassment or simply be a part of a characters appearance. 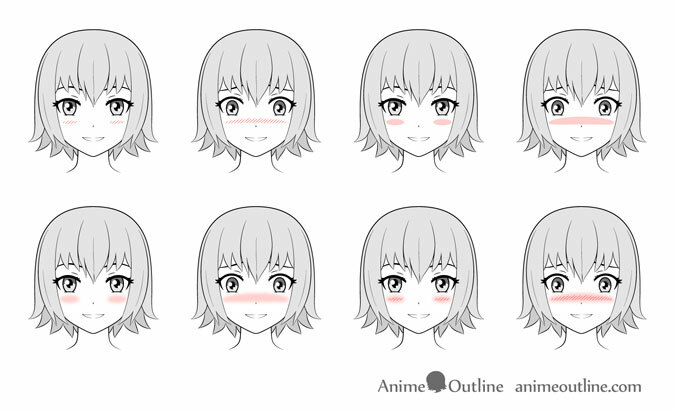 A “striped” anime blush is made with just a few line strokes and is fairly easy to draw. Simply make two sets of angled lines around the cheek areas. For a nicer looking blush make the outer stripes a bit shorter and the inner stripes a bit longer. Aim for a combined shape that can fit inside a stretched oval. Alternatively you can also make all of the stripes pretty much the same length. Above you can see the example of the “striped” blush drawn with all of the facial features. For a bigger “striped” blush you can draw it as one set of strokes going all the way across the nose area. You can again make the strokes longer in the middle and shorter at the outer edges. As you can see above this type of blush may be more appropriate for a more emotional (in this case embarrassed) face. The simplest blush to draw. You can indicate this blush with just a set of two ovals on the cheeks. You can also make these “bean like” shapes instead. 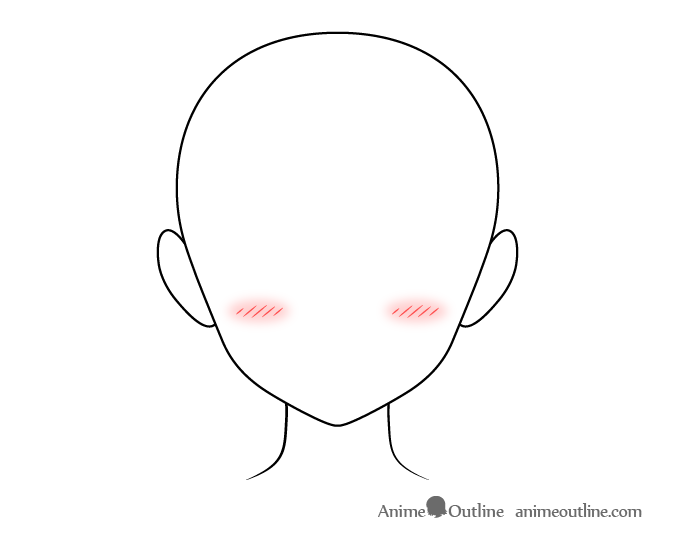 Generally this type of blush is used on more stylized or “Chibi” anime characters but more serious looking characters can have it as well. Above you can see how the “solid” blush will look on a more standard anime character. You can also draw a larger version of the “solid” blush with just one shape going across the nose and onto the cheeks. It may be a good idea to slightly curve this shape so it does not go over the bottom of the nose area. Again in the above example you can see how this type of blush will look with all of the facial features. The gradient or “blurred” brush is slightly more realistic looking. To draw this blush you can simply blend it outwards from a point below each cheek. You can see how the “blurred/gradient” blush looks with the facial features in the example above. For the larger version of this blush you can again make one shape that curves slightly above the bottom area of the nose. Again in the above example you can see the large “gradient” blush with the facial features. In some styles of anime and manga blush is shown with a combination of stripes and either a gradient or solid shape (usually gradient). To draw this type of blush first draw the gradient and then add the stripes over top (especially if drawing using pencil so that you don’t smudge the strokes). Once again you can see how the blush will look like on a fully drawn out face in the example above. For a larger version of the combined blush you can yet again simply draw it as one big “blur” going over the nose area and add a single set of lines over top. In this final example you can again see what this blush can look like with the facial features. 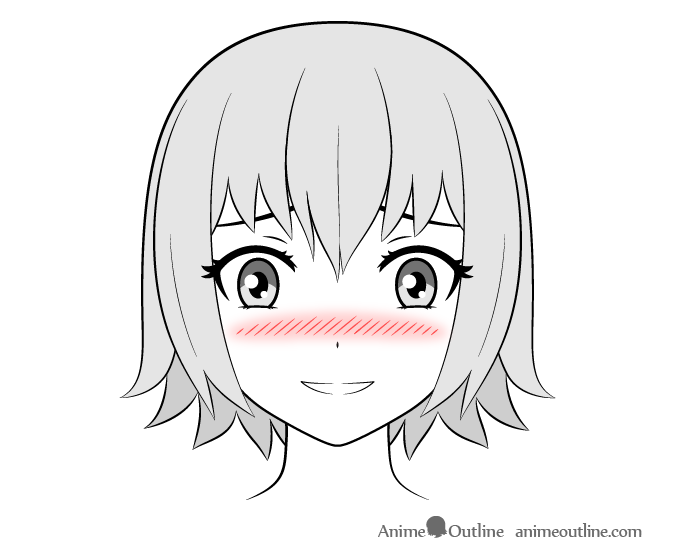 Blush is very common in anime and manga. 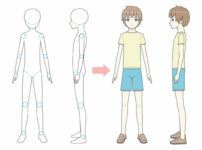 It’s very easy to draw and a good way to emphasize certain anime character emotions or personalities.